The world's love affair with Japanese soy sauce may have begun with Dutch traders who were stationed in Nagasaki during the seventeenth century. Those early middlemen sent barrels of this liquid treasure back to Europe, some of which ended up in the royal kitchens of Louis XV of France (1645 -1715). It was rumored around the court that the king's secret ingredient came from the other side of the globe, where it had been fermented for almost two years in three-meter-tall wooden casks. Since that time, Japanese soy sauce, with its rich, fermented fragrance and salty, slightly sweet flavor, has secured an international reputation as a versatile and delicious seasoning. Although Westerners now indiscriminately sprinkle soy sauce on everything from beef to popcorn, experienced cooks use it with discretion to enhance the subtle, natural flavors of foods. But beware: the dark, thick seasoning enjoyed by yesterday's European aristocrats is very different from most of the soy sauce sold in supermarkets today. Almost half of the 60 million dollars Americans spend annually on soy sauce is for a product containing soy extract, ethyl alcohol, sugar, salt, food coloring, and preservatives. Not fermented, this product is the result of a one-day chemical process. Nearly all of the remaining soy sauce sold in the United States is made from chemically processed soy meal and contains sodium benzoate as a preservative. High-tech, accelerated methods and temperature-controlled fermentation are used in the manufacturing of this product. If you want to experience the true flavor of traditional Japanese soy sauce, usually called "shoyu", read labels carefully. Traditional shoyu is made with water, cultured whole soybeans, whole wheat, and sea salt, and is unhurriedly aged in wooden casks at natural temperatures for eighteen months to two years. (Tamari is another type of traditional soy sauce related to shoyu, but it is wheat free and has slightly different cooking qualities than shoyu.) 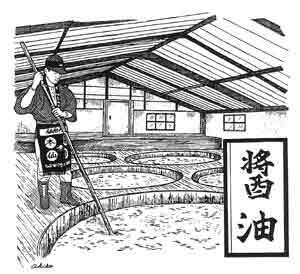 Shoyu contains no artificial preservatives; traditional producers rely on naturally occurring alcohol from wheat fermentation, which acts as a preservative.. A few shoyu producers, such as Mitoku's Kagisa Shoyu Company, add high quality mirin (sweet rice wine) as a natural preservative.